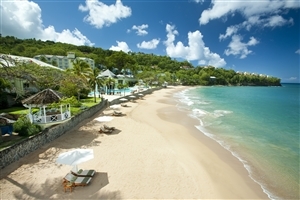 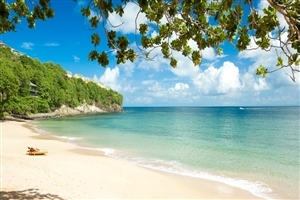 With its exotic bluffs, lush hillsides and rolling fairways, Sandals Regency La Toc Golf Resort & Spa is distinguished by its breathtakingly beautiful Caribbean location, making it perfect for a dream St. Lucia holiday. 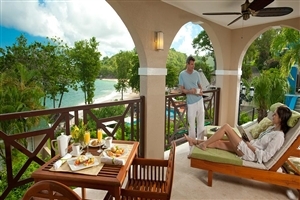 Experience luxury and romance like never before at the Luxury Included® Sandals Regency La Toc Golf Resort & Spa, where sumptuous Honeymoon Suites, exquisite gourmet cuisine and the incredible views will set the scene for an unforgettable couples’ holiday. 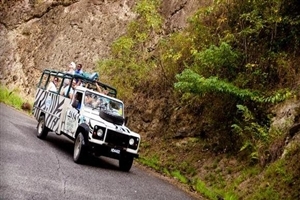 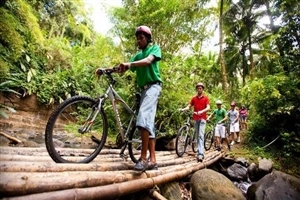 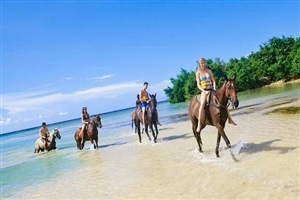 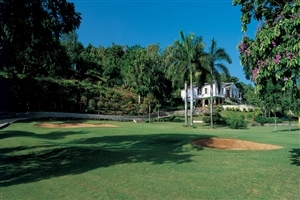 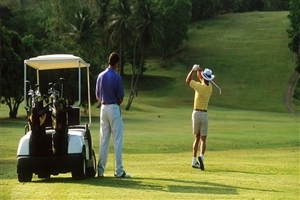 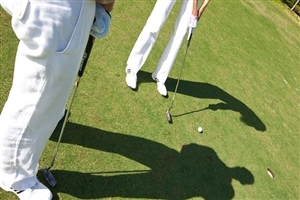 Sandals Regency La Toc Golf Resort & Spa also features its signature La Toc Golf Course, making it the ideal choice for those seeking a golf holiday in a paradise setting. 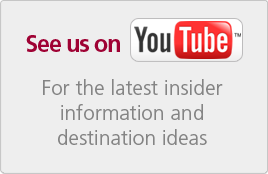 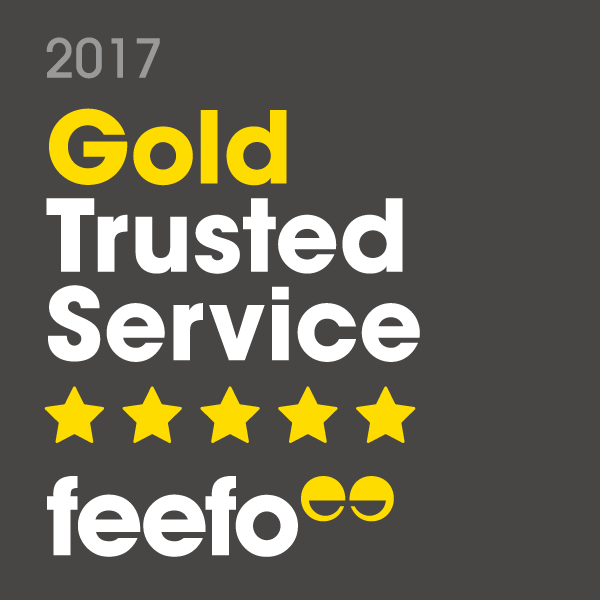 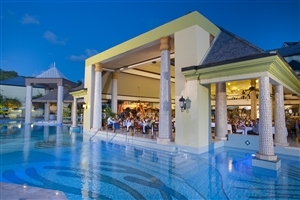 This is a Luxury Included® resort of superlatives: a wonderful location, fantastic accommodation, superb service and an outstanding range of activities and entertainment. 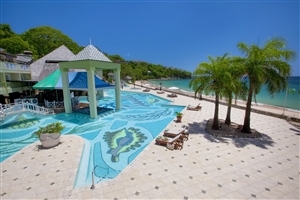 The magnificent half mile long crescent-shaped sandy beach will beckon you and there is a choice of three swimming pools, the main pool featuring a waterfall and romantic bridges. 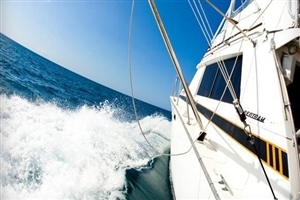 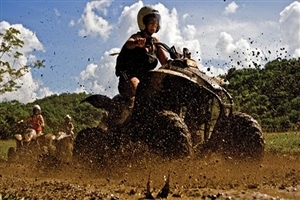 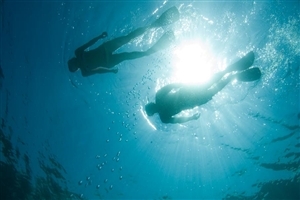 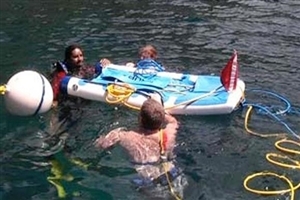 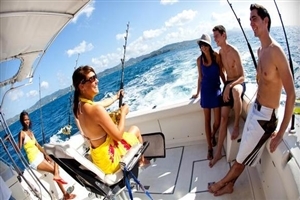 A varied choice of watersports includes sailing, snorkelling and scuba diving for certified divers and among other activities you can enjoy tennis and golf on the hotel's own 9 hole par 33 course (green fees are included but caddies at extra cost). 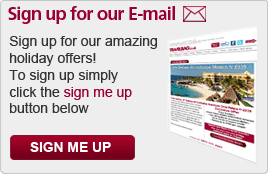 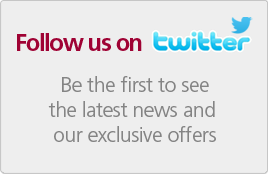 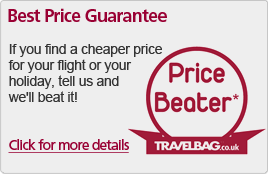 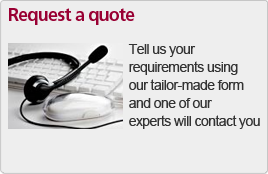 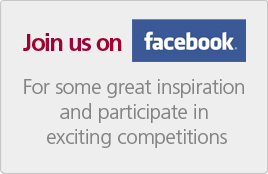 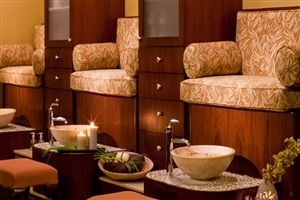 Massage and hydrotherapy treatment are available, at extra cost, in the acclaimed Red Lane® Spa. 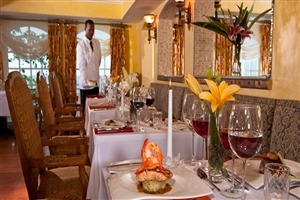 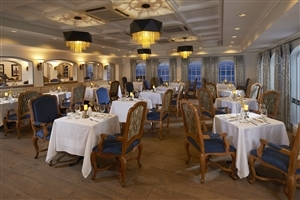 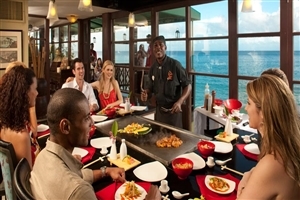 The choices for dining abound, from the informal atmosphere of The Pavilion, Italian dishes in Armando's or Oriental delicacies in Kimonos, Caribbean in the Pitons restaurant or fine French cuisine in the award winning La Toc. 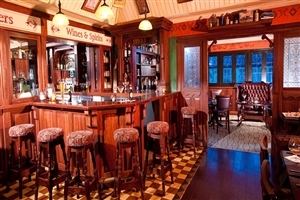 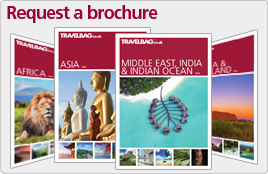 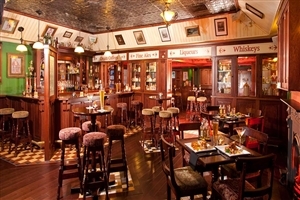 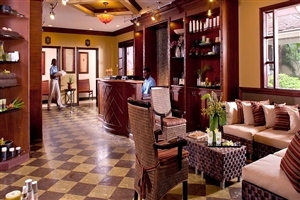 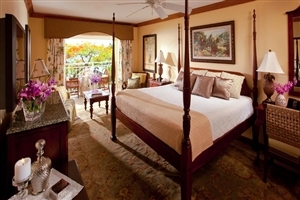 The rooms and suites are located in the main resort hotel building or are set within the grounds. 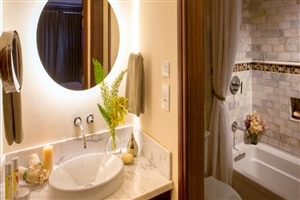 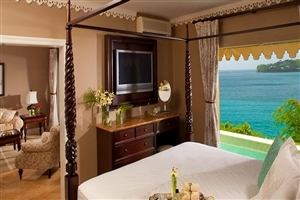 For upgraded room facilities such as a balcony, try Premium Rooms with their french balcony and whirlpool tub looking towards the golf course and spa, or the Luxury Oceanview Rooms featuring an enormous balcony and king bed. 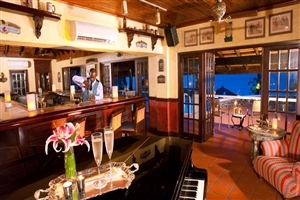 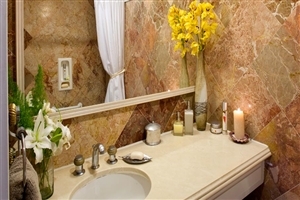 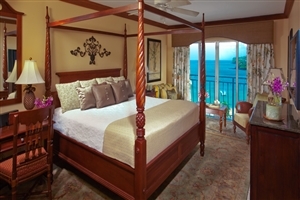 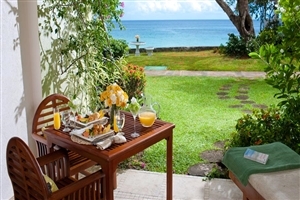 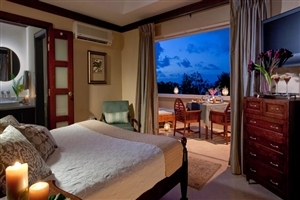 The Sunset Bluff rooms feature fantastic ocean views, and there are various exclusive rooms available for honeymooners. 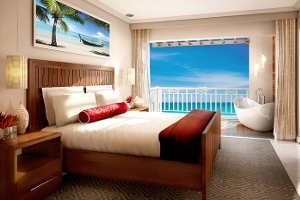 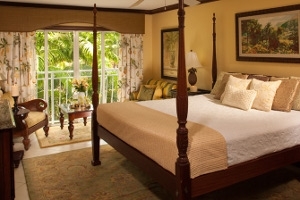 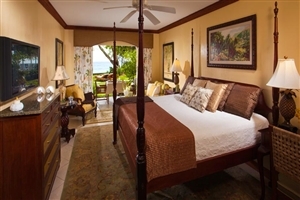 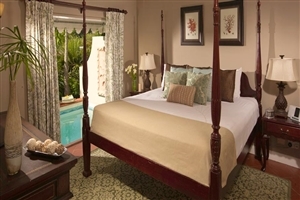 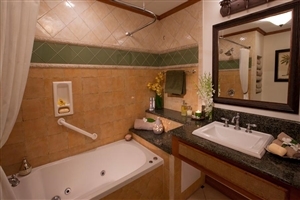 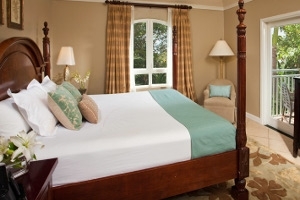 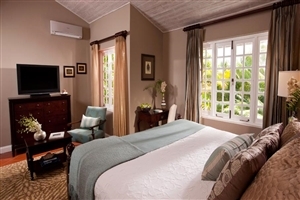 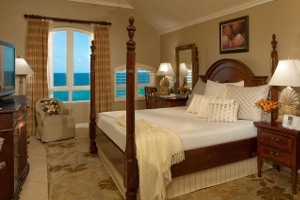 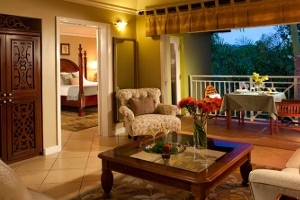 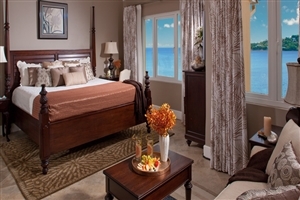 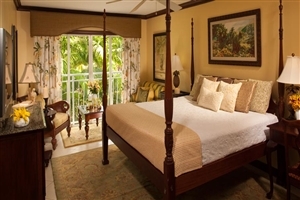 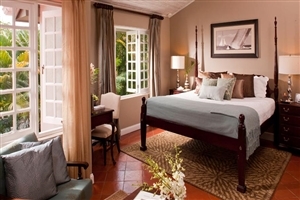 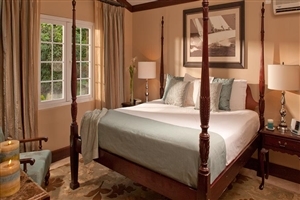 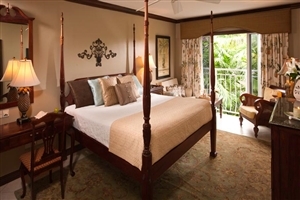 The Emerald Deluxe rooms at Sandals Regency La Toc Golf Resort & Spa are located in villas part-way up the hillside, boasting a four-poster mahogany bed while some rooms feature a French balcony. 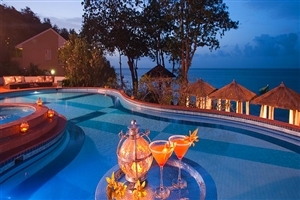 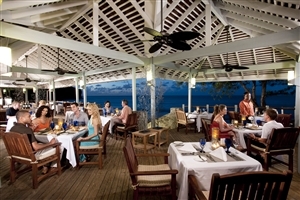 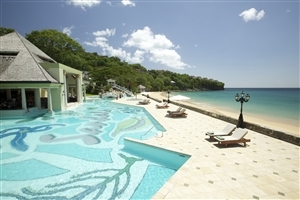 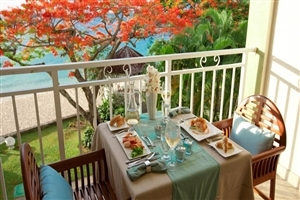 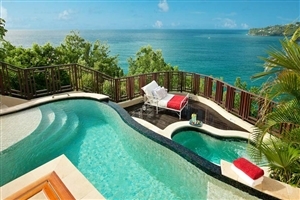 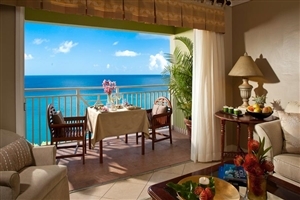 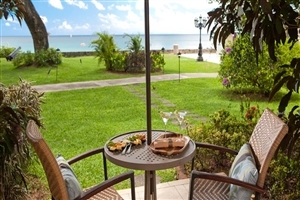 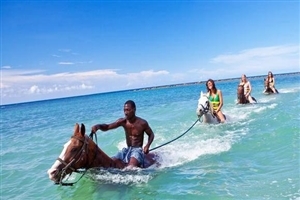 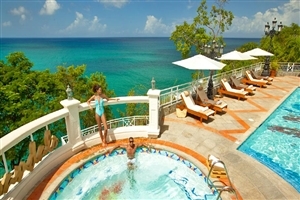 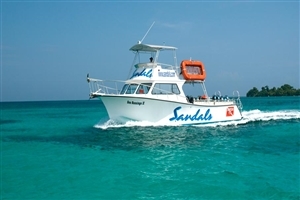 The Emerald Honeymoon Oceanview rooms at Sandals Regency La Toc Golf Resort & Spa offer direct views across the sparkling ocean from the step-out balcony or French balcony. 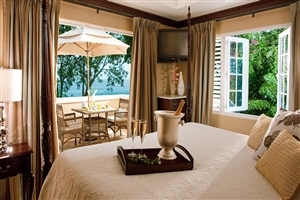 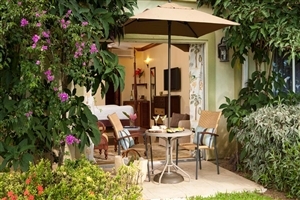 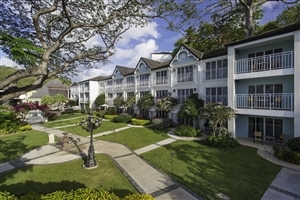 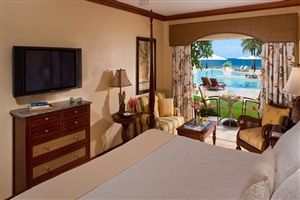 The Emerald Honeymoon Hideaway Grande Luxe rooms at Sandals Regency La Toc Golf Resort & Spa are beautifully styled and hidden amidst the verdant gardens of the resort, offering a world of peace with gorgeous views to enjoy. 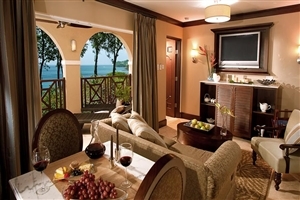 The Emerald Oceanfront room at Sandals Regency La Toc Golf Resort & Spa all feature a fabulous French balcony that overlooks the main pool and the ocean, while the resorts facilities are also closely located. 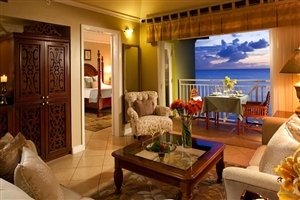 The Sunset Bluff Oceanview Club Level room at Sandals Regency La Toc Golf Resort & Spa features a separate sitting area and enjoys unforgettable views across the Caribbean Sea, while unique features include a whirlpool tub. 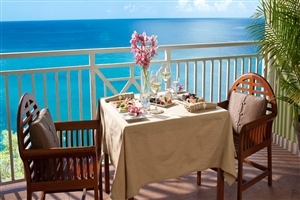 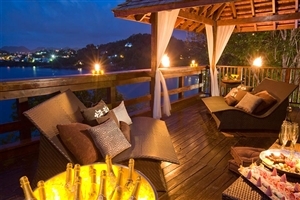 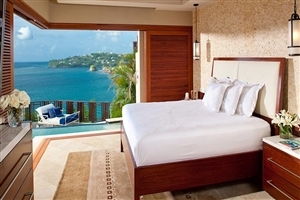 The Piton Oceanview with Private Sundeck Room at Sandals Regency La Toc Golf Resort & Spa offers a private sundeck from which to enjoy the St Lucia climate and admire fabulous views across the Caribbean Sea. 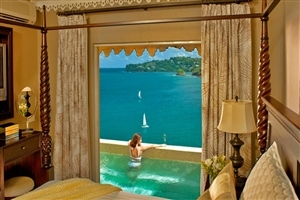 The Sunset Bluff Honeymoon Oceanfront One Bedroom Butler Villa Suite with Private Pool at Sandals Regency La Toc Golf Resort & Spa is a Love Nest Suite® that features a living room that opens out onto a patio and a private plunge pool, while exclusive privileges include Butler Service, 24 hour room service and transfers to and from the airport. 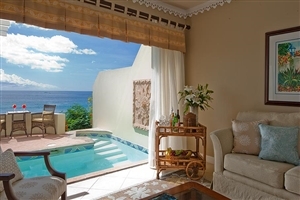 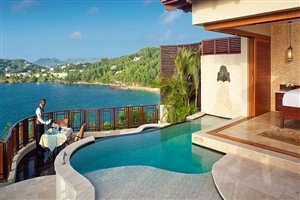 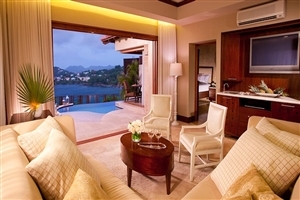 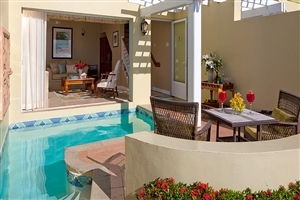 The Sunset Bluff Oceanfront Two Storey One Bedroom Butler Villa Suite with Private Pool at Sandals Regency La Toc Golf Resort & Spa comprises of a sumptuous bedroom on the upper level, with a living room and a private plunge pool on the lower level. 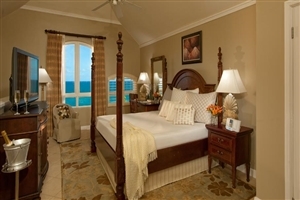 The Love Nest Suite® overlooks the Caribbean Sea and are available with Butler Service, 24 hour room service and transfers to and from the airport. 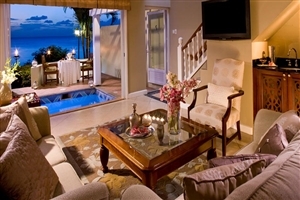 The Water’s Edge Honeymoon Two-Storey One Bedroom Butler Villa Suite with Balcony Tranquility Soaking Tub at Sandals Regency La Toc Golf Resort & Spa is a two storey Love Nest Suite® that brings warmth, style and serenity together, providing everything from butler service and a spacious living room to a private balcony that allows for direct beachfront access. 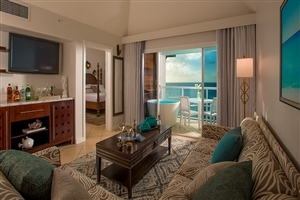 The Emerald Beachfront Walkout Club Level Room at Sandals Regency La Toc Golf Resort & Spa is located on the first floor for direct beachfront views and access, while Sandals’ Suite Concierge service is also available. 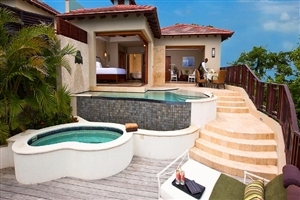 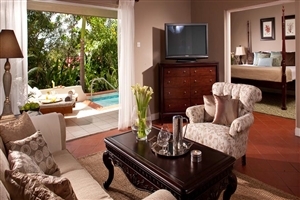 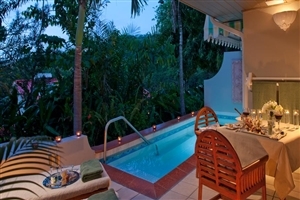 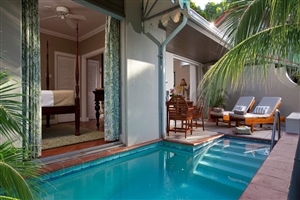 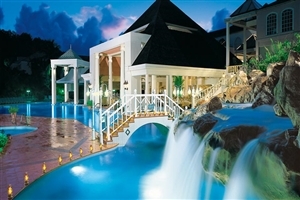 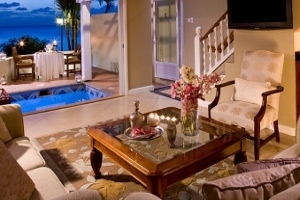 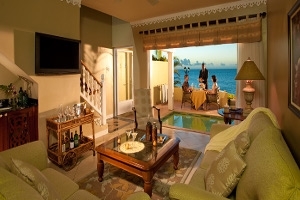 The Honeymoon Hideaway One Bedroom Butler Suite with Private Pool room at Sandals Regency La Toc Golf Resort & Spa is a Love Nest Suite® that features a large tiled-floor bedroom and a separate living room, which leads out onto a patio and a private plunge pool. 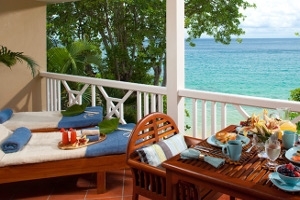 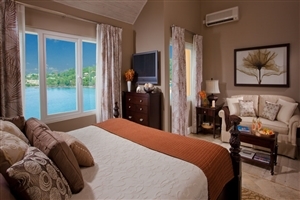 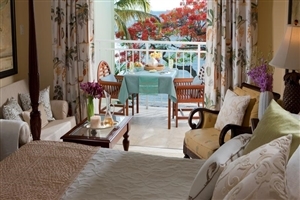 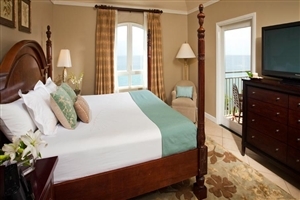 The Piton Oceanview Two Storey Butler Veranda Suite at Sandals Regency La Toc Golf Resort & Spa is spread across two-storeys and offers superb Caribbean Sea views from the oversized porch. 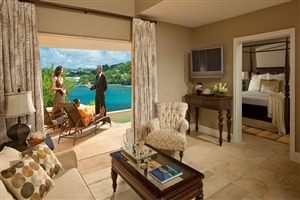 The Love Nest Suite® features a bedroom on the upper level and a sitting room on the lower level, while guests can also take advantage of Sandals’ superb Butler Service. 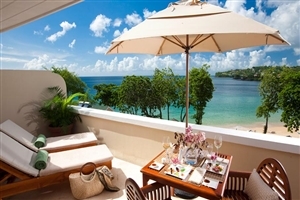 Situated along the Sunset Oceanview Bluff, these newly renovated Love Nest Suites® grant stunning views of the sea and hillside. 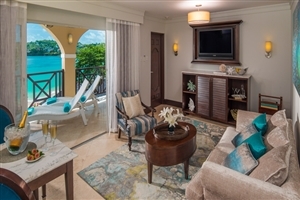 Relax in the comfort of a spacious, modern living room appointed with custom crafted furnishings, an HD Smart television, fully stocked bar, and plush seating. 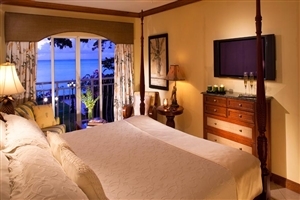 The master bedroom features a king-size bed, additional HD Smart television, and large windows framing unforgettable views of the sea. 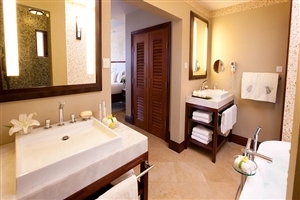 The en-suite spa style bathroom features modern finishes, a backlit mirror with long vessel sink, shower, and free standing soaking tub. 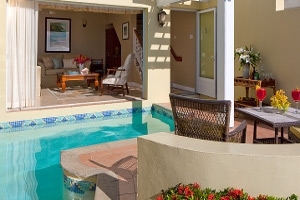 Just outside the living room is a furnished private balcony including a bistro set and Tranquility Soaking Tub for two, where you can enjoy al fresco dining with the ocean as your backdrop. 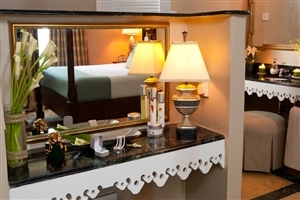 Butler Elite and 24-hour room service are included. 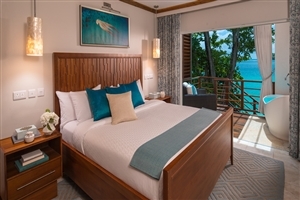 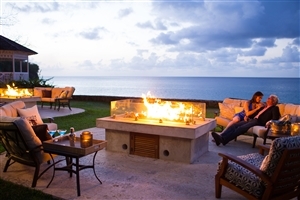 These newly renovated honeymoon Love Nest Suites® are hidden within a lush garden atop the Sunset Oceanview Bluff and grant supreme privacy and romance. 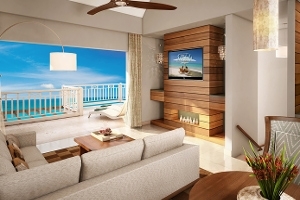 Relax in the comfort of a spacious, modern living room appointed with custom crafted furnishings, an HD Smart television, fully stocked bar, and plush seating. 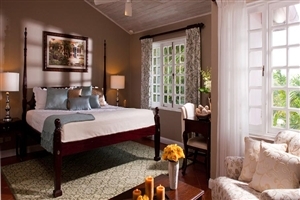 The master bedroom offers a king-size bed, additional HD Smart television, and large windows framing serene tropical garden views. 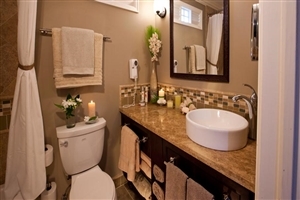 The en-suite spa style bathroom features modern finishes, a backlit mirror with long vessel sink, shower, and free standing soaking tub. 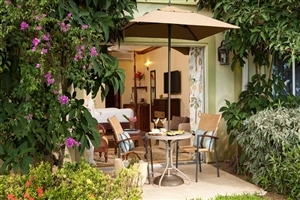 Outside the living room is a furnished private patio including a bistro set and Tranquility Soaking Tub for two, where you can enjoy al fresco dining. 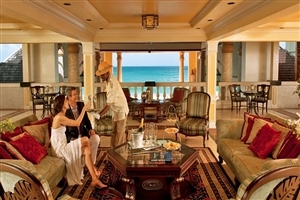 Butler Elite and 24-hour room service are included.